Yesterday Kevin Cheng, Charmaine Sheh, Roger Kwok, Ben Wong and Jason Chan appeared at TVB City to shoot an active wear promotional clip. Former rumored pair Kevin and Charmaine expressed they do not feel awkward seeing each other again. Kevin expressed he wishes to collaborate with Charmaine again, he said: "We haven't collaborated in a long time! I really anticipate another collaboration with Charmaine. I will shoot a series next year too." When speaking of TVB planning to change the policies on how they treat their artists, Kevin laughed: "Is it true? TVB never has their scripts [ready]. Well if the executives said so, then its gonna happen! These two things are good. 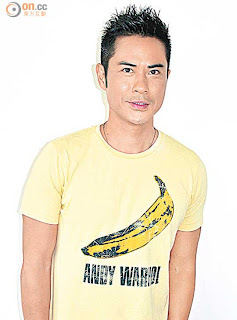 I heard TVB is planning to do a remake of old classics, then there definitely will be a script." Charmaine expressed she knows about TVB inviting Film Kings Anthony Wong and Tony Leung (Kar Fai) back to shoot series. She said: "Of course I want to collaborate with them; I can learn from them, but the scripts will be chosen by my company." When speaking of Kevin anticipating to collaborate with her again? Charmaine said: "Really? I want to too."